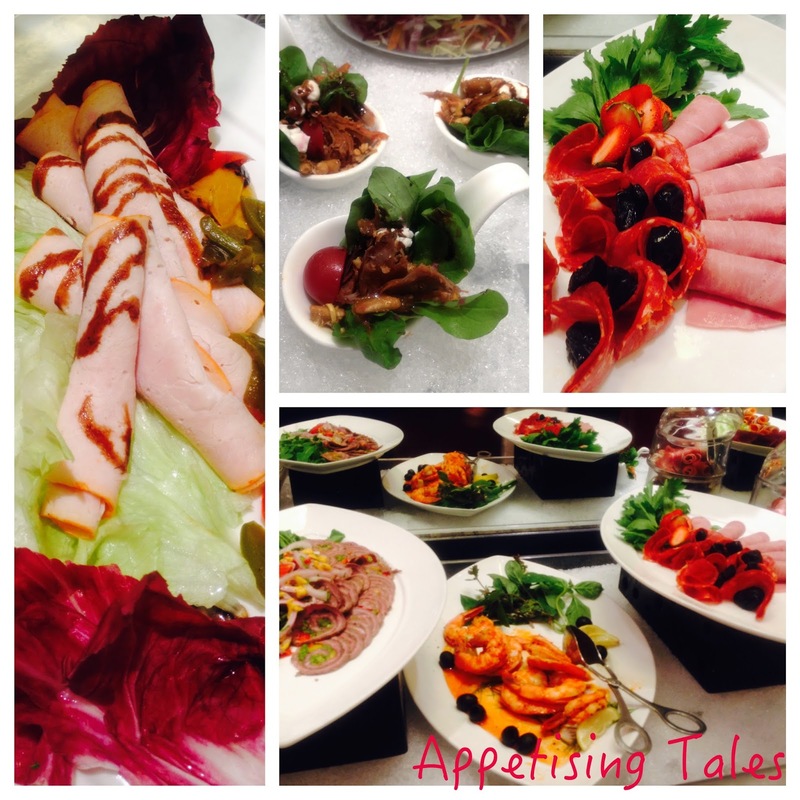 The ITC Maurya has consistently featured one of the finest buffet spreads in the capital. 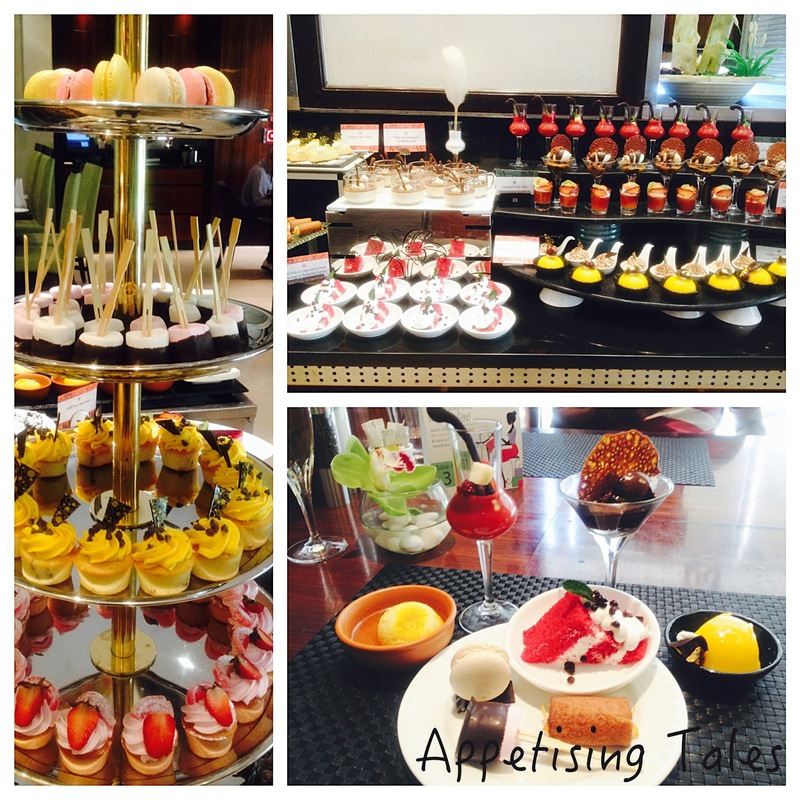 Long before The Leela Ambience Gurgaon and Setz came up with the seven-kitchen concept, The Pavilion had been featuring a vast variety of quality fare in its buffets on a daily basis; the choice was even larger on weekends and special days. So, on International Women’s Day (that is celebrated to honour and recognize the contribution of women) The Pavilion put together an exclusive brunch where Delhi’s leading lady chefs came together to showcase their signature creations. 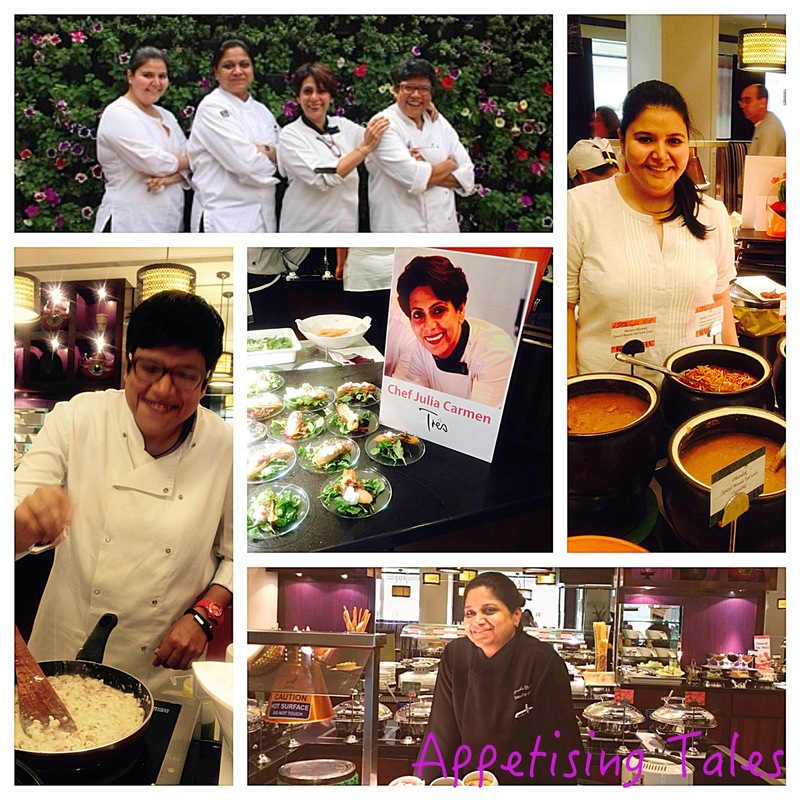 Clockwise from Top Left: The Goddesses of Good Food; Kainaz Contractor; Manisha Bhasin; Ritu Dalmia; Julia Carmen. The ‘Goddesses Of Good Food’ include Diva’s Ritu Dalmia, ITC Maurya’s Manisha Bhasin, Tres’s Julia Carmen and Rustom’s – Parsi Bhonu’s Kainaz Contractor. The highlight of the afternoon is the camaraderie between the chefs that is infectious and creates an atmosphere of bonhomie in the restaurant. 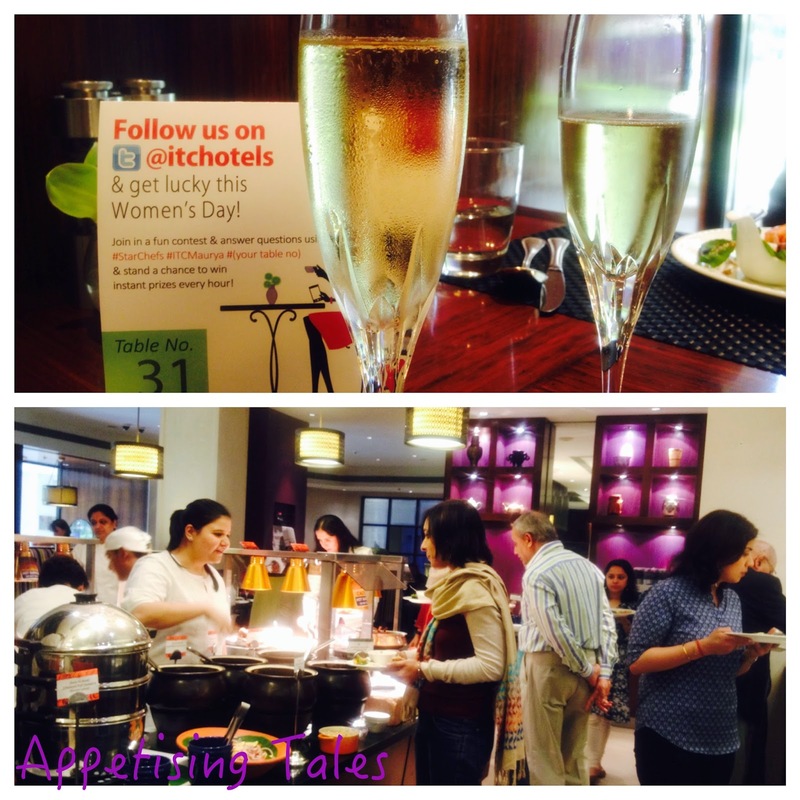 To add to that, all the ladies dining anywhere at the ITC Maurya are served a complimentary glass of sparkling wine on this day. While I take a look around and interact with the chefs I realize that choosing where to start is a daunting task for me. So I decide to start with the customary Salad Bar. Apart from the regular cold cuts, I relish the Spicy Grilled Prawns, the Lobster With Tomato Salsa and the Tandoori Raan pulled and tossed with ruccola, caramelized pinenuts and feta. Salad Bar and Cold Cuts. I then head to Julia Carmen’s station who has created and served many-a-delicious dishes at Tres. The Goat Cheese Churros with roast beetroot and caramelized apples and walnut dressing is fab. The churros are being made fresh and are beautifully light and crisp. The melting goat cheese on top and the chunky walnut sauce bind all the ingredients in a delicious mix. The Slow Cooked Chicken Parcels are stuffed with melted mozzarella and plum tomatoes, topped with fresh basil leaves and served in a rich tomato sauce. I am really looking forward to the Oven Baked Sea Bass with parsley and mushroom crust in a light grainy mustard sauce since I used to love the mushroom crusted sole at Tres that was served with a crab and mustard infused sauce. This version is not similar though - the mustard somehow overpowers the mushroom crust that is delicious. Clockwise from Top Left: Goat Cheese Churros; Slow Cooked Chicken Parcels; My Platter; Oven Baked Sea Bass. Moving on to Chef Manisha's creations, I savour the Jaipur Lamb basted in pomegranate and black pepper and the Sole with the Spiced Crust but my favourite is the Homemade Cottage Cheese with sundried tomatoes, edamame beans and a methi-infused sauce. The whole dish just comes together beautifully. I am told that the Quinoa and Oyster Mushroom Pulao is fabulous but I skip it to save space for Ritu and Kainaz's creations. 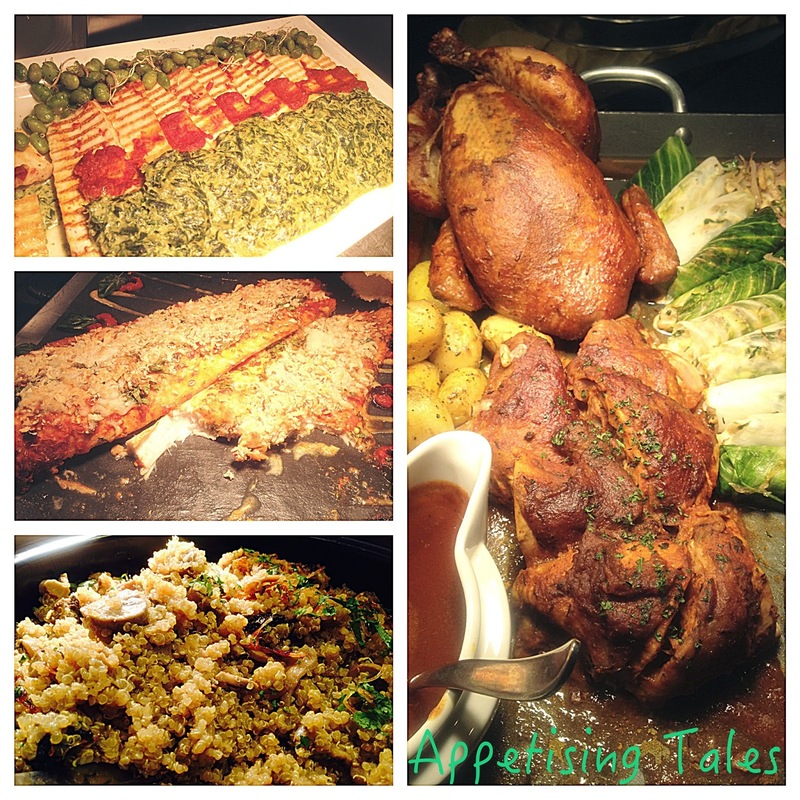 Clockwise from Top Left: Homemade Cottage Cheese; Roast Chicken; Quinoa and Oyster Mushroom Pulao; Spice Crusted Sole. Ritu Damlia’s Gnocchi Caprese is as delicious as it is simple. One just cannot go wrong with the refreshing flavours of basil, tomato, mozzarella and garlic. 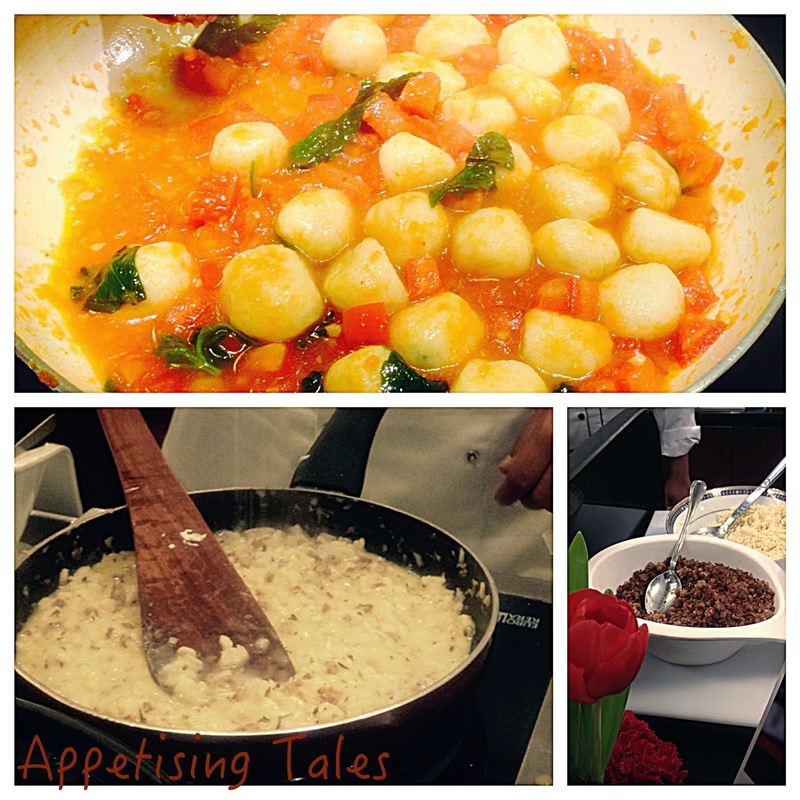 But keeping the gnocchi light is an art that Ritu has certainly mastered along with keeping the balance of all the flavours that make this dish so warm and comforting. And what can I say about the Four Cheese Risotto with crumbled sausages? Heaven for cheese lovers! Top: Gnocchi Caprese; Bottom Left: Four Cheese Risotto; Bottom Right: Crumbled Sausages. And finally I head to the Parsi counter! Kainaz is the former food editor of BBC Good Food magazine and recently shifted base from Mumbai to Delhi to open a Parsi restaurant featuring her family-owned recipes. I have been wanting to try her three-week old restaurant Rustom’s – Parsi Bhonu that has opened to rave reviews. The Patra Ni Machi is chutneyed fish steamed in banana leaves. I appreciate the liberal helping of chutney in this. The Jardaloo Marghi Ma Salli is chicken cooked in a sweet and sour tomato gravy with dried apricot topped with crunchy potato straws called salli. A tasty dish, this is best enjoyed with caramelized rice. Again, sheer comfort food this is. (I look forward to having this home-delivered soon!) Then there’s Dhansak and Mutton Dhansak that’s a spiced masala dal that is slow cooked so that the lentil grains become like a smooth paste. Both the vegetarian and non-vegetarian options are great and the mutton pieces in the latter are meltingly tender. 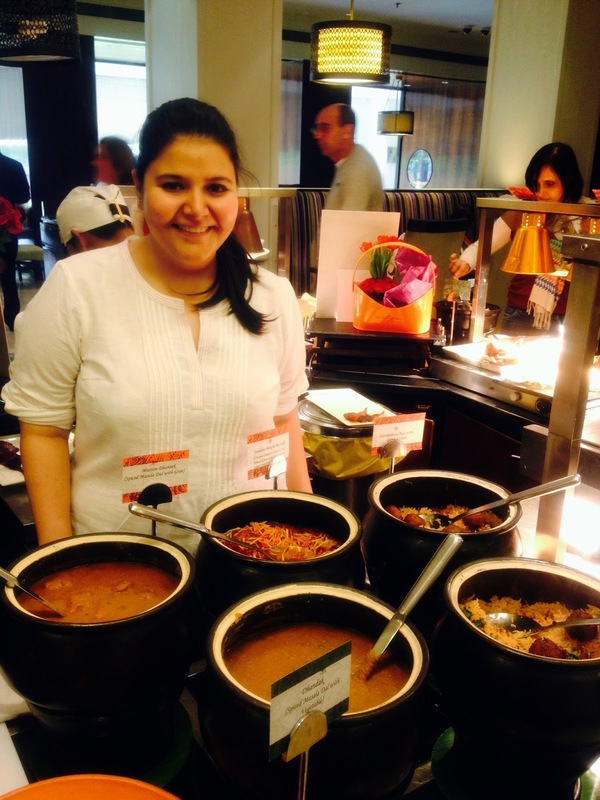 Kainaz Contractor with her delicious Parsi fare. And you would think that after all this food I would skip dessert, right? Wrong! I seem to have a separate compartment for dessert. The choice in the dessert section is as wide as in the savouries. I'll just leave you with a mouthwatering image of some of the things that are on offer and a few that i indulged in. A fraction of the Dessert Counter. I am told that we can look forward to more delicious buffets at The Pavilion featuring a combination of chefs from within the ITC and beyond. 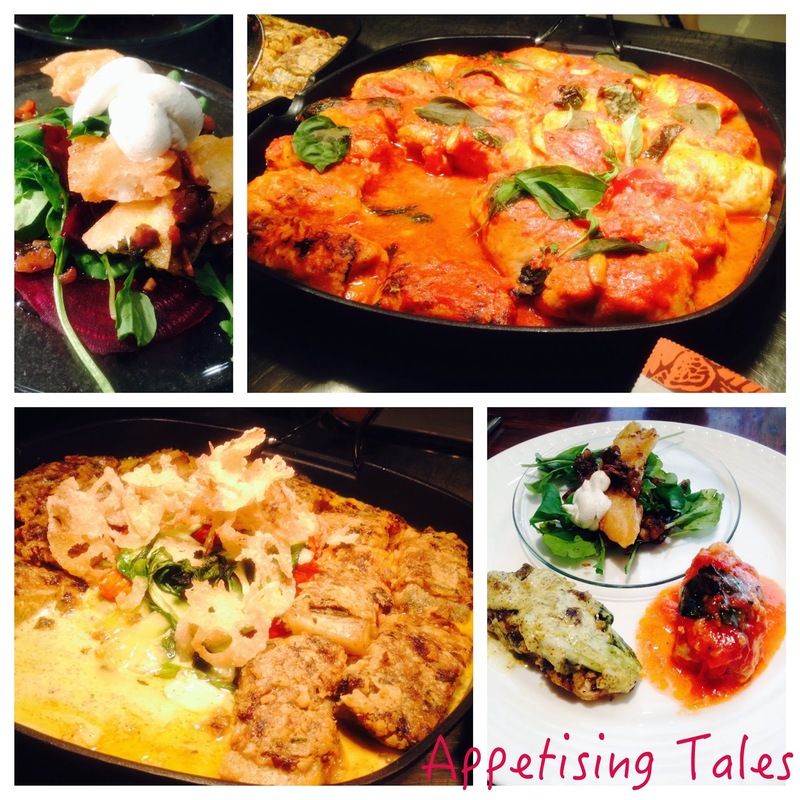 So keep a watch out.. or come back to Appetising Tales to know more about the goings on. The Pavilion, ITC Maurya, Sardar Patel Marg, Diplomatic Enclave, New Delhi. I learned a lot from the previous parts and with this part, I didn't learn much at all.